The new singer composer phenomenon caused composer Alessandro Scarlatti to leave Naples in 1725. What Happened to Opera as a Result of the Singer Composer Phenomenon? Many composers at that time would write scores of historical interest. However, they had little if any musical interest. Opera composers turned from opera to writing for other mediums, such as instrumental. Society in Italy mainly fawned over virtuosity in musical drama. This gave rise to the Golden Age of Bel Canto. Francesco Bernardi, for example, loaded his adagios with countless ornaments. Opera singers became heroes. Hogarth immortalizes a singer in one of his arias in The Rakes Progress: He receives the adulation of a lady who says: “One God, one Farinelli.” The composer was reduced to the sideman. As a matter of fact, the admiration of opera singers of the at time was so tremendous that most were totally unconcerned with the excellence of an opera itself. For that reason the music of many operas had nothing more than a figured bass and perhaps the outline of a melody. They singer flushed out the rest of the opera. The singer was also the primary composer. Figured bass, or thoroughbass, is a kind of musical notation in which numerals and symbols (often accidentals) are used. They indicate intervals, chords, and non-chord tones that a musician is to play. Historically this was most often applied to piano, harpsichord, organ, and lute. 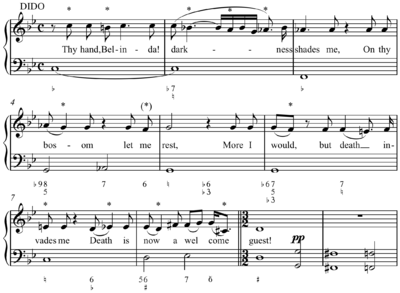 Example of writing style with figured bass. Melody from the opening of Henry Purcell‘s “Thy Hand, Belinda”, Dido and Aeneas (1689) with figured bass below ( Play (help·info).